Ashraf Mantoo pointing at a marked apple tree in his orchard. This will be cut to make way for NH444. Surrounded by half-a-dozen apple trees, branches stooping under the weight of year’s crop, Shabir Ahmad Bhat’s under-construction house looks like a perfect get-away. Since last one year, despite his busy schedule as contractor, Bhat is overseeing the construction, adding details, trying to create a perfect abode for his small family. “It is a dream house for us,” said Bhat, as he sadly looks at a circled red mark on the outer tin wall of the house. The red mark was painted by survey officers two months back, to mark the boundary of upcoming National Highway (NH) 444 project. “They want to construct a four-lane road right through my house,” said Bhat while looking at the numbers painted in red near the circle. NH444 is an ambitious Rs 1800 crore Government of India project, which will join Bemina in Srinagar with Qazigund in Islamabad via Budgam, Pulwama, Shopian and Kulgam. While connecting six districts, this 100 kilometer long road will pass through fertile rice fields, apple and pear orchards, through graveyards, by razing houses and shops, to reach the highway town Qazigund. From Shopain, it takes about twenty minutes by car to reach Narwaw, a tiny villageof 70 odd households, where Bhat lives. Since the marking was done in Narwaw and its adjoining villages, Bhat is a sad man. 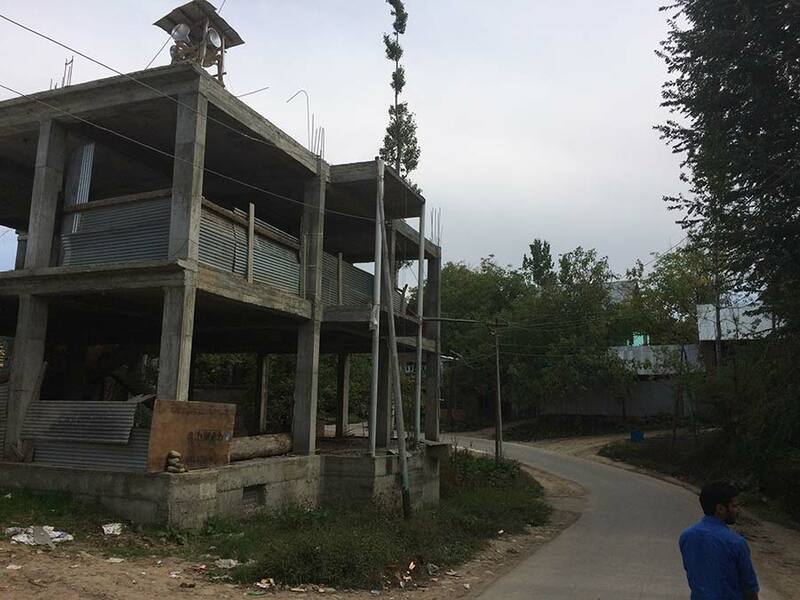 “I am confused; should I go on with the construction or stop,” said Bhat. But it isn’t only Bhat’s house that will be devoured by NH444. His 4.5 kanal ancestral apple orchard, located adjacent to his new house, which earned him Rs 12 lakh last season, will go as well. “I will be left with nothing,” said Bhat sadly. A few meters away from Bhat’s under-construction house lives Mohammad Ashraf Mantoo, 60, a retired teacher. Post retirement, he shifted from nearby Gagren village to Narwaw, and constructed a small single storey house inside his 3 kanalancestral apple orchard. A part of Ghazi Khan shrine’s courtyard in Vehil village will be demolished for NH444. Ashraf has another apple orchard just across the 12 feet wide road, which connects Narwaw village with Kulgam. In the middle of this orchard, on a 15-year-old apple tree, stooped under the weight of season’s fruit, a red marking stares at Ashraf like a death warrant. “This tree is the centre-point of new highway,” said Ashraf. Ashraf was told that the requirement for NH444 is 60 feet on the either side of the marked tree, reducing his 7.5 kanal apple orchard to a 50 feet wide strip. “I will be left with just ten percent of the trees,” said Ashraf. In Vehil village, some 2kms from Narwaw, the tension among residents is visible as the proposed NH444 will pass through local graveyard, edging into the courtyard of nearby local shrine of Baba Ghazi Khan, a fifteenth century Sufi saint. A beautiful stone-and-brick structure built on a raised platform, Baba Ghazi Khan’s shrine was rebuilt four-times since it was first constructed, more than 400 years ago. “This shrine is our cultural and religious heritage. How can we allow anybody to construct a road through it,” said FayazAhmad Rather, 50, a government teacher who currently heads village’s Auqaf Committee. The shrine is embedded in local culture to the extent that no marriage ceremony is complete unless a groom pays visit here. “In old times grooms used to come here on horsebacks,” said Rather. 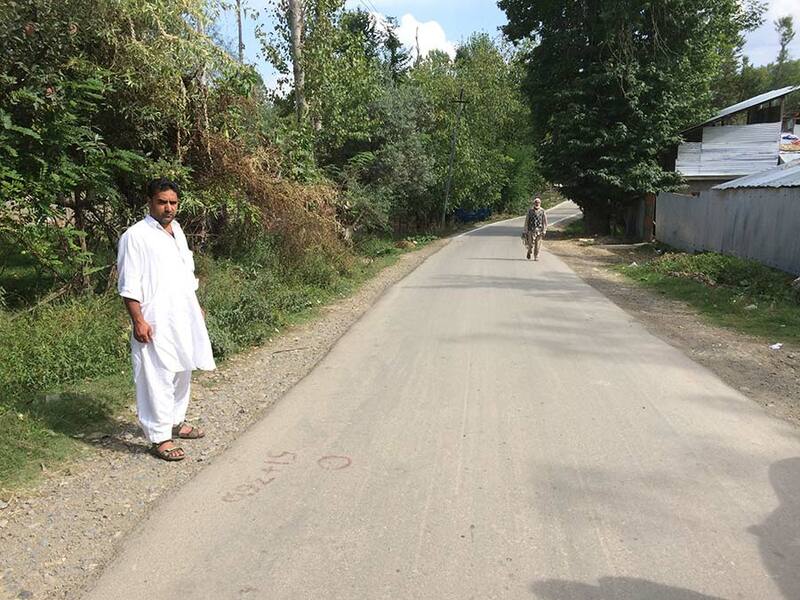 Nisar Ahmd Bhat stands on a road which will be widened to make way for NH444. On festivals like Eid, thousands of people from nearby villages visit the shrine to pay their respect.Inside the small courtyard, which will soon become part of NH444, rest two Moulvis (clerics) who were killed by unidentified gunmen during early 90s. They were both from Deoband town in Uttar Pardesh. 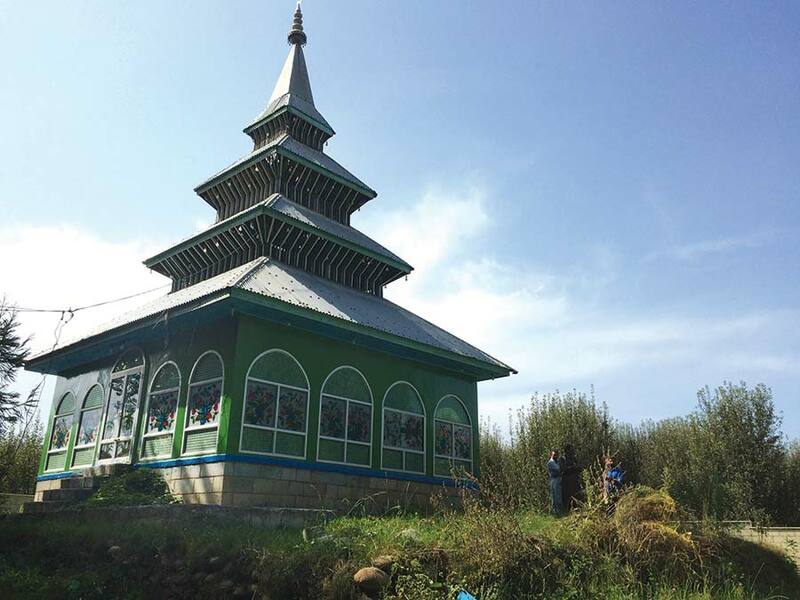 “We are not against any developmental project, but we won’t let them use our graveyard or this Shrine,” said Ghulam Mohammad Khan, 55, the local village head. The alternative route proposed by Khan runs parallel to apple orchards, mostly through government owned barren tracks of land. “I don’t understand why government is after our orchards when they can construct a road elsewhere,” asks Bhat. Till summers Nisar Ahmad Bhat, 40, a contractor, was a happy man with yearly income from his 12 kanal orchard exceeding Rs 20 lakh. But a small red circle painted in the middle of the road, just outside his newly constructed three-storey house, is giving him sleepless nights. The circle marks centre of the proposed NH444, which, if constructed, will devour his house and nearby orchard entirely. “What will be I left with?” asks Nisar with a sad face. Nisar, a third generation orchardist, has met local revenue officials with same suggestion as Khan – alter the proposed route to nearby barren government land. But they (local officials) told Nisar that they are helpless as the project is under National Highway Authorities of India (NHAI). On July 24, 2015, NHAI approved three highway projects in Kashmir: Baramulla-Rafiabad-Kupwara-Tanghdar (NH 701), Baltal-Panchtarni-Chandanwari-Pahalgam-Batakut-Martand-Khanabal (NH501) and Srinagar-Shopian-Qazigund (NH444). “These highways are approved with the aim to improve road infrastructure in pilgrim and border towns and backward areas of the state, where there was very poor road network and existing roads were unable to cater to increasing vehicular movement,” an official communication reads. 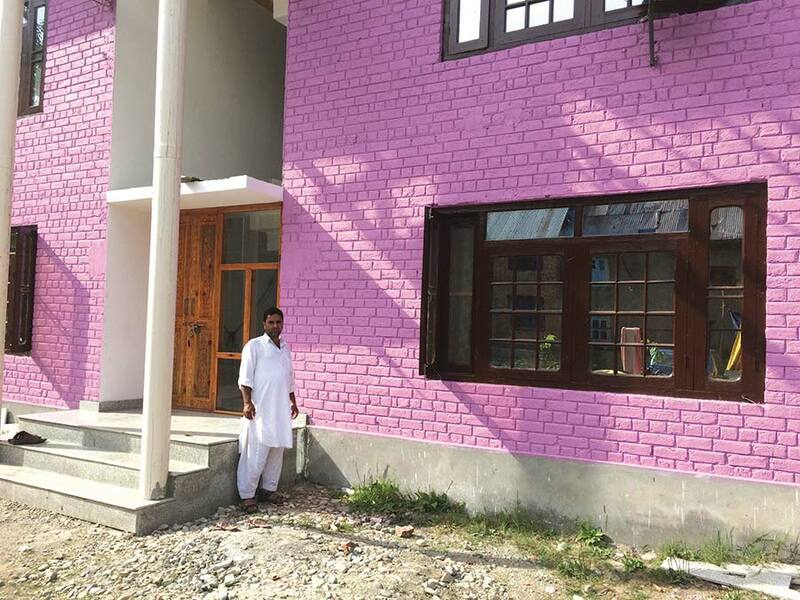 Nisar Ahmd Bhat stands outside his newly constructed house which will be demolished for NH444.